1. iPod Selection Button If an iPod is connected, the system switches to the iPod mode from the previous mode to play the song files stored in the iPod. If there is no iPod connected, then the system displays the message "No Media" for 3 seconds and returns to the previous mode. o Press the [TRACK ] button for less than 0.8 second to play from the beginning of the song currently played. Press the button for less than 0.8 second and press it again within 1 seconds to move to and play the previous track. Press the button for 0.8 second or longer to play the song in reverse direction in fast speed. Press the button for less than 0.8 second to start or stop the random playback of the songs within the current category. Press the button for longer than 0.8 second to randomly play all songs in the entire album of the iPod. Displays the information of the file currently played in the order of TITLE -> ARTIST -> ALBUM -> NORMAL DISPLAY -> TITLE ->... (Displays no information if the file has no song information.) 6. SEARCH Knob & ENTER Button When you turn the button clockwise, it will display the songs (category) ahead of the song currently played (category in the same level). Also, when you turn the button counterclockwise, it will display the songs (category) before the song currently played (category in the same level). To listen to the song displayed in the song category, press the button to skip to and play the selected song. Pressing the button changes the BASS, MIDDLE, TREBLE, FADER and BALANCE TUNE mode. The mode selected is shown on the display. After selecting each mode, rotate the Audio control knob clockwise or counterclockwise. Moves to the upper category from currently played category of the iPod. To move to (play) the category (song) displayed, press TUNE/ENTER knob. You will be able to search through the lower category of the selected category. The order of iPod’s category is SONG, ALBUMS, ARTISTS, GENRES, and iPod. o Some iPod models might not support the communication protocol and the files will not be played. 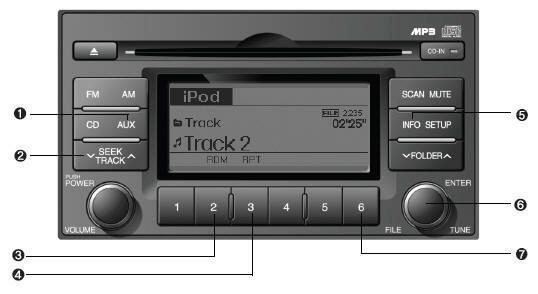 (iPod models supported: Mini, 4G, Photo, Nano, 5G) o The order of search or playback of songs in the iPod can be different from the order searched in the audio system. o An iPod may not operate normally on low battery. o Some iPod devices, such as the iPhone, can be connected through the Bluetooth interface. The device must have audio Bluetooth capability (such as for stereo headphone Bluetooth). The device can play, but it will not be controlled by the audio system.